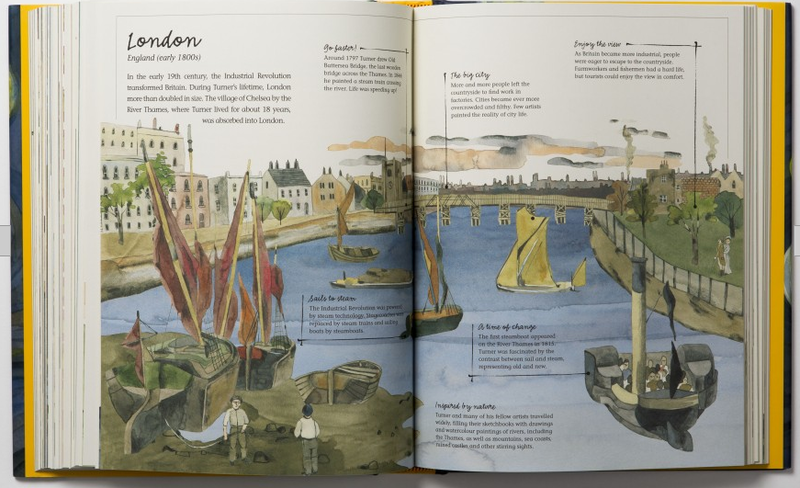 Vincent's Starry Night and Other Stories: A Children's History of Art perfectly pairs writer, art historian and radio broadcaster Michael Bird with the London based Laurence King Publishing, one of the world's leading publishers of books on the creative arts, acclaimed for their inventiveness, beautiful design and authoritative texts. From a cave in Germany 40,000 years ago to 21st century artist Ai Weiwei, Bird divides the history of art into eight periods, traveling the world from Cambodia to Egypt, Europe, China and New York City, featuring the stories of more than 68 artists. 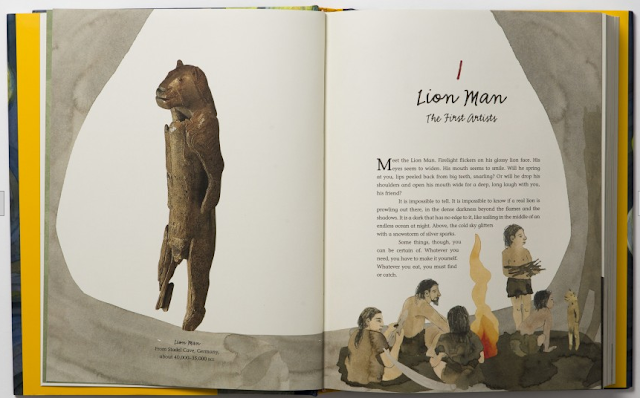 The photographed art of featured artists is paired with illustrations by Kate Evans that help tell the stories that Bird uses to tell the stories of the art and the artists. 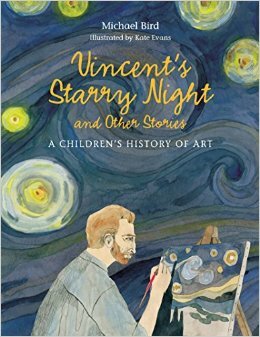 Vincent's Starry Night and Other Stories: A Child's History of Art can be read from cover to cover, the narrative is so entertaining and engaging. 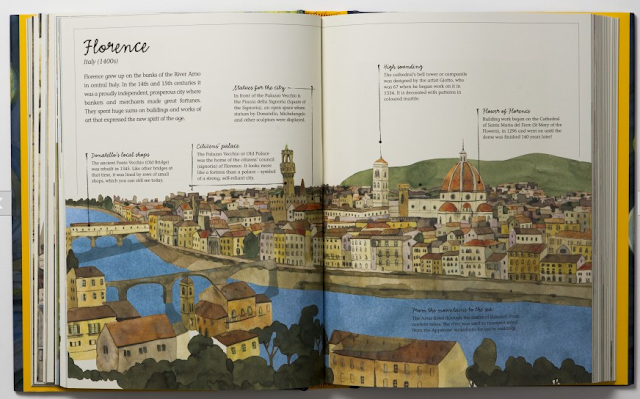 I could easily see this book being bedtime reading for many families. After all, art is a form of visual story telling. Bird has a way, sometimes playful, of putting the reader in the room with the artist. Chapter 33, which features Diego Velázquez and his 1656 painting The Maids of Honor, begins, "'Boo!' Diego Velázquez jumps. His brush leaves a black smudge on his forehead - that is, the forehead of his own portrait, which he is painting just here, to the side of his enormous painting of the royal family. He turns to see five faces looking up at him." The little Princess Margarita Teresa and her maids of honor, along with their companions, the dwarfs Maria and Nicolas. In the part Revolution! 1750 - 1860, Bird puts readers on the dangerous streets of Paris when Jacques-Louis David learns of the murder of his friend Marat and how he comes to compose his famous portrait of the radical journalist and Revolutionary politician. From David, we find Goya in Spain and his decision to paint the violence, suffering, and helplessness of his people amidst the chaos of the time. Occasional maps place the artists and their art as well as give a feel for the time period. His narratives also help make sense of some modern art, the meaning and important of which might escape many of us. 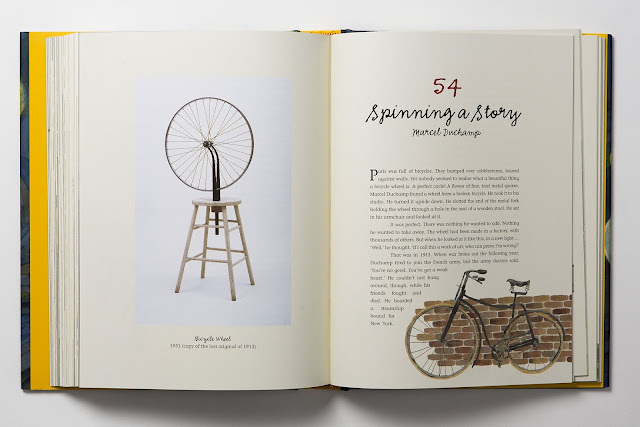 Chapter 54 finds Marcel Duchamp, sitting on a park bench in New York City as World War I raged on, reading a letter from his sister, a nurse in Paris. She is cleaning out his studio and he wonders what she has done with his piece, Bicycle Wheel. Interestingly, the original was lost in 1913 and what we see today are replicas. The rest of Duchamp's story about what he thinks defines art and the ways in which his ideas challenge those of most others. Vincent's Starry Night and Other Stories: A Children's History of Art ends with Ai Weiwei and his Sunflower Seeds installation. For his final story, Bird imagines a brother and sister visiting the work in 2011. Told not to touch the porcelain seeds by a guard, the older sister decides to research the artist and make her own seed. The story ends with a Google search and a view of Weiwei on CCTV as he opens the front gates of his home in Beijing, where he is still on house arrest. A poignant ending to a marvelous book that should sit on the shelf of every child's room. If you take nothing else away from Vincent's Starry Night and Other Stories: A Children's History of Art, even if we don't understand a work of art, ultimately art helps us understand what it means to be human.